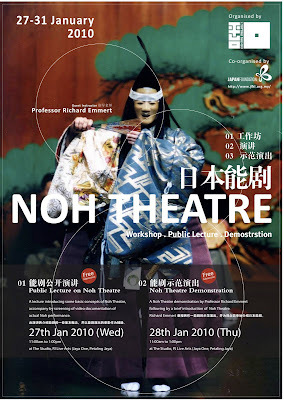 A lecture introducing some basic concepts of Noh Theatre, accompany by screening of video documentation of actual Noh performance. The Noh workshop will be an introduction to the performance techniques of Japanese classical Noh theatre with special emphasis on movement and music. Two dances from Noh theatre will be taught as well as the singing to accompany these dances. Furthermore, the musical instruments and the masks used in Noh will also be demonstrated and discussed. Finally, several videos of Noh performance will also be shown and discussed to give context to the workshops. HSBC in The Arts + The Japan Foundation Kuala Lumpur + KLPac + Colorganda! 1) If you are interested, please e-mail or give us a call, we will then e-mail an application form to you. 2) Please complete the application form and e-mail it back to us. The workshop fees must be paid before 10th January 2010. If payment is not received in time, the organizer has the right to cancel your application. 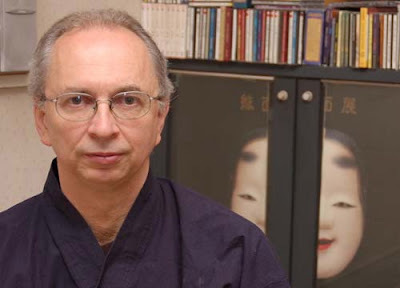 Richard Emmert has studied, taught and performed classical noh drama in Japan since 1973. He is a certified Kita school noh instructor, and has studied all aspects of noh performance with a special concentration in movement and music. A professor at Musashino University in Tokyo, he directs an on-going Noh Training Project. In summers, he leads the intensive three-week Noh Training Project in Bloomsburg, Pennsylvania sponsored by the Bloomsburg Theatre Ensemble. He has co-authored a series of Noh performance guides published by the National Noh Theatre in Tokyo. He has also led extended Noh performance projects in Australia, India, Hong Kong, the UK, the US, Canada, and most recently at the University of Hawaii, has composed, directed, and performed in eight English noh performances, and has released a CD entitled Noh in English by the Japanese Teichiku Records. He has also performed and/or directed several Asian multi-cultural performances including Siddhartha by Teater Cahaya performed in Kuala Lumpur in 2003. The founder and artistic director of Theatre Nohgaku, a company dedicated to performing noh in English, he has led performance tours of At the Hawk's Well and Pine Barrens and also toured in Crazy Jane. Theatre Nohgaku (TN) got its start in 2000 when I invited advanced students from my Noh Training Project workshops in Tokyo and Bloomsburg, Pennsylvania to gather for a week in Bloomsburg to work on William Butler Yeats' At the Hawk's Well, music for which I had composed in noh style in 1981 and which had several productions thereafter. I also invited several other English speakers who had also studied noh in Japan. These people gathered with the idea of attempting to see whether noh in English was both interesting for them and viable as an art form. The history of plays in English being called "noh" seems to have originated with Yeats when he wrote his At the Hawks' Well in 1916. He however did not use the style and instrumentation of the music of noh but used musicians who played music composed for the production by Edmund Dulac. And here immediately is what I consider a misunderstanding of what noh is. Noh plays cannot be considered in the same way as Shakespeare plays. A Shakespeare play might be done in many different ways and still be called a Shakespeare play. Noh however is more like opera. Taking the text of a Verdi or Mozart or Britten opera, discarding the music and performing it in another style other than opera, would make it difficult to call an opera. Perhaps one could call it a performance based on opera lyrics. But is it still a Verdi opera when the lyrics are just spoken? Is it still a Mozart opera if the text of Marriage of Figaro is done in the style of Beijing opera without Mozart's music? Is it still an opera if it is done in the style of noh? I personally don't think so. An opera is one which is done in a particular style that we recognize as opera. Likewise, a noh play (and perhaps "play" is misnomer---it is more a musical or dance-drama) is one which is done in a style that can be recognized as noh. A Mozart opera performed without Mozart's music in the style of noh is a noh performance. A performance using the text of the classical noh play Kiyotsune sung in the style of opera is not a noh play, but it is an opera. And for this reason, though Yeats called his play a "noh" play, it was, in my opinion, a Western musical performance whose text was influenced by noh. But it was not a noh play. That really had to wait until the Japanese noh scholar, Yokomichi Mario, made an arrangement for Hawk's Well in Japanese in 1949 with members of the Kita school performing, and then yet another version of it in 1965 with members of the Kanze school. 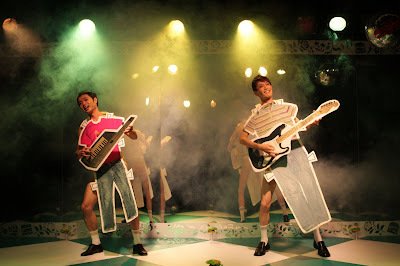 Both of these so-called shinsaku or "new works" were in Japanese and have been performed occasionally since. In the noh world, these versions are considered noh plays, but doing a version using the original music by Edmond Dulac is not. On the other hand, the version I composed in 1981, followed both the Yeats English and the musical style and structure of noh. It was, to my knowledge, the first time that anyone had written strict noh music to go with the original English of Yeats' play. It was an English noh. Since Yeats, I can imagine that there might have been others who have written texts influenced by noh, and likely even called them "noh plays." Of course, according to my perspective, they are not noh until they are done in the musical style of noh. One that came very close to being a noh performance was the play St. Francis, written by Arthur Little with music by Leonard Holvik. This was performed at my alma mater, a small Quaker liberal arts college in Indiana called Earlham College. In 1970 when I was in my second year of college, the two professors conducted a seminar on noh which I joined. The seminar commenced with reading noh texts in translation, listening to recordings of noh music and seeing the one film about noh that was available. We then began to rehearse the play in English which the two professors had created. The structure of the text followed closely some of the typical structures of classical noh. The music was meant to suggest noh, but was written so students not trained in actual noh musical techniques could still perform it. I was chosen to be the main actor, or shite, for the performances we gave, hardly imagining at the time that this was a first step in what would develop into a lifetime relationship with noh. It was only later when I went to Japan in 1973, that I happened to meet a young noh actor---Mr. Akira Matsui who has joined this tour---and decided to take lessons from him in the chant and dance. Later, I began taking lessons in the four noh instruments as well and developed an understanding of the music of noh, in particular the relationship between the drums and the text and how text and rhythm are so important in creating what we can call the style of noh. After studying noh in Japan from that time and even though I was told by several people that the music of noh developed from the Japanese language and therefore could not be done in other languages, I began to feel the typical rhythms of noh in my body. It wasn't a stretch for this native English speaker to begin to think of English text and how it fit with those noh rhythms. When Jonah Salz, a young American director based in Kyoto, asked me in 1981 to write music for a production of At the Hawk's Well that he was planning, it was easy to throw caution to the wind and to dive in and write music for the Yeats text in noh style. Performances followed in Kyoto, Osaka and Tokyo. Yokomichi Mario, the director of the earlier Hawk's Well versions in Japanese and my professor of noh music studies at Tokyo University of Fine Arts, told me at the Tokyo performances of our Hawk's Well, that my version was "too noh-like." On reflection, his complaint told me that I could have explored the noh style in a way which departed from typical classical noh structures, but it also seemed to clearly recognize, if there was still any doubt, that yes, noh can be performed in English. Over the next several years, I composed music for and directed and performed in several English noh. They were: 1) a Tokyo production of American Janine Beichman's play Drifting Fires, a story about space travelers in the distant future visiting the place where the planet "earth" once existed and there meeting the spirit of the last human being (1985); 2) an Earlham College production readapting St. Francis in a stricter noh style (1988); 3) a University of Sydney production of Australian Allan Marett's Eliza, a story of a British woman shipwrecked off the coast of Australia and forced to live with aboriginal people, and who in turn came to appreciate the unique sense of dream and time among them (1989); 4) a San Francisco Theatre of Yugen production of Crazy Horse by American Erik Ehn which collaborated with Native American performers to tell the story of the great Native American chieftain (2001—later retitled Moon of the Scarlet Plums for a 2005 Japan-US tour); 5) a Vancouver production of Canadian poet Daphne Marlatt's The Gull, a play about cultural identity issues of Japanese fishermen and their families along the British Columbia coast and touted in Canada as "the first Canadian noh" (2006); 6) a University of Hawaii production of my own English translation of the classical Japanese noh Sumidagawa. During the 1980s, there were two others in Japan who produced plays which can be considered English noh or at least noh-influenced English plays. First, Kuniyoshi Munakata Ueda, a Shakespeare specialist at Shizuoka University, began using noh with Shakespeare, notably Hamlet and Othello. Although the plays sometimes lacked a clear sense of the relationship between poetic text and drum rhythms that give noh its vitality and intensity, they did include chant and movement in noh style as well as noh musicians. And second, my good friend and now fellow member of Theatre Nohgaku, David Crandall, wrote and directed two plays, Crazy Jane and Linden Tree, both which had a strong noh structural feel in terms of text but employed his own musical composition for a Western instrumental ensemble and voices. In the above list of English noh, you might have noticed the large gap between the noh plays I wrote music for in the 80s and the next one which didn't follow until 2001. It was in 1991 that I started an ongoing semi-intensive Noh Training Project in Tokyo, and then in 1995, a summer intensive Noh Training Project in Bloomsburg, Pennsylvania. After working on English noh in the 80s, it seemed clear that if it was to become viable, that it was necessary to have a group of trained native English speakers to make it happen. 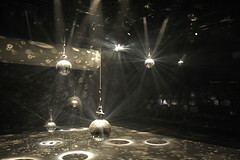 After years of workshops which planted these seeds, Theatre Nohgaku was born. We had our first tour in the United States in 2002 of Yeats' At the Hawk's Well. In 2003, we began an annual Writers' Workshop geared toward playwrights and poets interested in writing plays in the style of noh. In 2004, we collaborated with the Noh Training Project for its 10th anniversary performance in Pennsylvania of the classical noh Kurozuka in Japanese. 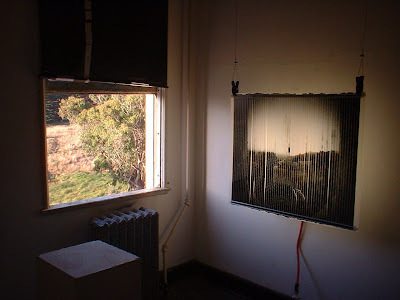 In 2006, we toured TN member Greg Giovanni's Pine Barrens, a story of the so-called New Jersey devil said to roam the pine barrens of New Jersey. In 2007, we toured David Crandall's Crazy Jane which he readapted to be sung in noh style with a noh ensemble. And finally, earlier this year, we once again collaborated with the Noh Training Project for its 15th anniversary by performing the classical noh play Funabenkei in Japanese. This production of Pagoda in collaboration with the Oshima Noh Theatre is of course another step in our development as a company. But perhaps more importantly, it is another big step in making noh an accessible art form for the English-speaking world. Au Sow Yee is always “mysterious”. Some had seen her works for multimedia design in local theatre, but had never seen her personal works and the mechanics that triggered. Some do not even know the name of the person who created those visual images. Sow Yee believe that “there will be no film without light”. 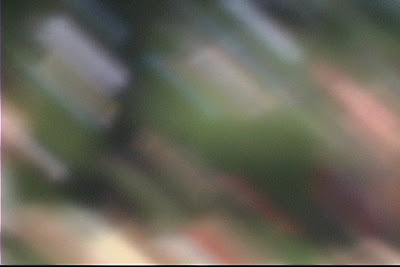 Images on screen lead audiences to a world of illusions and imaginations, and all these depends on the magical ability of the projectionist, to cast light over the remnants of life on the film strips. 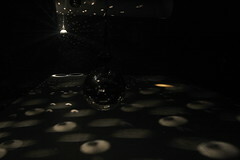 Therefore Sow Yee used to work as a projectionist, aiming to be a magician of light who create poetic moments. Her experimental film/video does not tell stories. Most people might not understand, or even think that this is something insane. But through her abstract images, we see some traveling magical moments. Artom Bomb . Pentas Cross-Disciplinary Lecture Series VII invites you to feel the magic hours of Au Sow Yee, and optical illusions and pre-history of moving images that attracts her for a long time. 區琇詒 Au Sow Yee 馬來西亞實驗電影創作者。文化大學影劇系、美國舊金山藝術學院藝術創作研究所畢。目前為馬來西亞新紀元學院戲劇與影像系講師、劇團平臺計劃企劃，以及另類藝術工作室SicKL成員。她致力於探索光與影像作為空間和時間裏的有機元素，以及以影像發掘現實場域的抽象特質。她的創作橫跨錄像、實驗電影以及劇場影像設計。2007年獲Krishen Jit Astro Fund，並曾在臺灣、韓國、日本、義大利、美國等地發表實驗電影以及表演性電影作品。 Experimental filmmaker and video artist based in Kuala Lumpur, Malaysia, Sow Yee is a MFA holder from San Francisco Art Institute and is currently a lecturer in Drama and Visuals Department, New Era College, Malaysia. She is also the Programming Director of Pentas Project Theatre Production (Malaysia) and member of Studio in Cheras KL (Malaysia).Her works explore light and projected images as organic elements in space and time as well as reveals the abstract quality of everyday live. 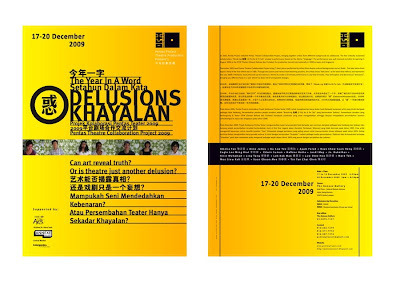 Sow Yee was the recipient of the Krishen Jit Astro Fund in 2007, and have shown her experimental films/video and performative cinema series in Taiwan, Korea, Japan, Italy, USA etc. Her works span from experimental film/video, film/video performances to multimedia design for theatre. So your life is apathetic? You're welcome to Old China Cafe at 3pm on 28th June. 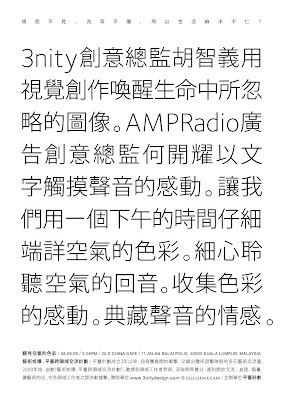 Joseph Foo, the Artistic Director of 3nity will recall the neglected images in your live, while Advertising Creative Director of AMP Radio Networks Hoe Kai Yew will touch your heart with words. Pentas Project, established three years ago, has since facilitated many collaborative creations among its residence members, successfully interweaving multidisciplinary artforms with elements of magic and surprise. In 2009, Pentas Project started “Artom Bomb project - Pentas Cross-disciplinary Lecture Series”, and invites multidisciplinary workers in the domain of the arts to participate, interact, and share their own professional experiences and expertise. These series of talks or workshops will be held monthly. This program is designed to promote interdisciplinary exchange, to acknowledge the importance nurturing of multi-disciplinary sharing, to achieve a platform for open and inspiring interaction, and to actively communicate in a situation of great diversity of learning methods, with new perspectives in order to pursue its own achievements. This program also lays the a foundation for future collaborations among its participants. The artists from these diverse professions are not solitary beings. They are always inspired and connected to each another. 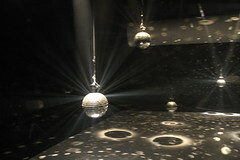 The premiere of Untitled in 2003 received tremendous reviews. 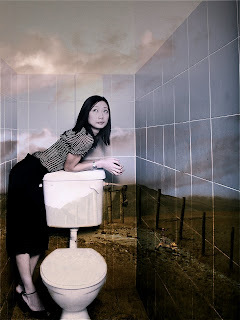 After 6 years, Pentas Project presents a new version of it which has been renamed Toilet - extracting the reality and imagination of everyday lives, audiences may discover their real selves as the cast criticize each other and go on about the insidious problems of our society. 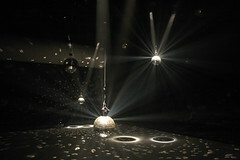 Through physical movements, sound, installation, lighting and speech Toilet will look into the map of desire hidden inside our hearts.